Have you ever heard the parable of the sower? Jesus taught it, and one record of it can be found in Matthew 13:3-8. I’ve read that story hundreds of times. I’ve heard sermons about it, been in classes on it, and even preached about it myself. Perhaps this familiarity is why the crazy message it contains was completely lost on me. I just read it as normal. But the fact is the sower in this story is anything but normal. He’s crazy. In fact, he acts like no other farmer I know. Would a normal farmer act like the sower in Jesus’s story? Really? Do you think so? Would a normal farmer purposefully waste seed? Of course not. What would you think of a farmer dropping seeds in the middle of the road? Wouldn’t you think he was crazy? After all, that is seed that will clearly and obviously not produce any fruit for him, will not feed his family, and will not produce anything he can sell to make a living. It is wasted and lost. It won’t feed his family, it only feeds the bird. What does a normal farmer do? If he sees soil that is packed down, he gets out a tiller and breaks it up. If he sees a field with stones in it, what does he do? He removes the stones before he sows the seed. If he sees a field with weeds in it, he removes the weeds before he sows the seed. That is what the normal farmer does. He tests the soil and cultivates his field, then he sows his seed. Anything else is crazy and irresponsible with the seed. But that is not what Jesus’s sower does. He sees wayside soil and he drops seed on it. He sees stony fields and he drops seed on it. He sees weedy soil and he drops seed on it. He sees good soil and he drops seed on it. This sower didn’t plow or furrow his field. He didn’t weed the fields. He didn’t cultivate the soil. He just sowed the seed. Why would Jesus tell the story of such a crazy farmer to people who know the guys is acting crazy? I mean, do you really believe in Jesus’s day they didn’t know seed dropped on the beaten down path wouldn’t grow? Of course they did. You think they didn’t know if you were farming you should remove the stones and weeds before sowing the field? Of course they did. So why is Jesus telling a story about such a silly sower? Because Jesus isn’t actually talking about literal seeds. He is talking about the Word of God (Matthew 13:18). He isn’t talking about soils. He is talking about souls. While a sower of literal seed can tell the difference between wayside, stony, weedy, and good soil before he sows the seed, the only way we can tell the difference between these four souls is by sowing the seed and seeing what happens. Think about it. Would you have pegged Saul as “good soil”? Yeah, me either. So, you may be asking, how had missing this made my evangelism exactly backwards. I’m glad you asked. I’ve thought evangelism was about testing and cultivating souls. I’ve thought my job was to develop relationships with people. I thought my job was to plow the ground of their heart by impressing them with my good life and my love and remove stones and weeds by letting them know how much I cared. Then, when the relationship was fully developed and they knew how great a person I was because of the gospel, then drop the seed in. I’ve literally told people they shouldn’t just sow the seed but should first cultivate the soil. And when I did, I was saying the exact opposite of Jesus’s story. Shockingly, I did that while using the very story that says this opposite message. But that is exactly backwards to the picture of evangelism Jesus presents. 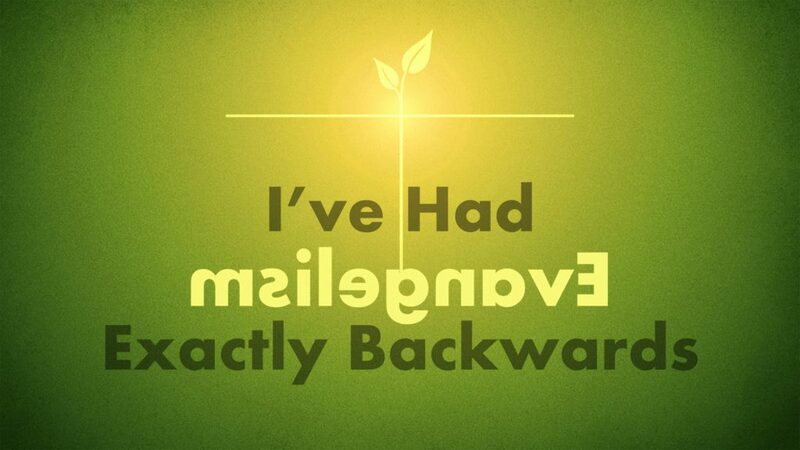 I’m not trying to be offensive, but I bet you’ve had it backwards too. Let’s play a game. I call it “Stump the Blog Reader.” I’ve got a couple of questions for you with increasing difficulty. The first one is easy, but they get harder after that. I bet I can stump you. Question #2: Where was Jesus when He made the above statement? Question #3: Who was Jesus talking to when He made the above statement? Question #4: To which congregation or evangelist was Paul writing when he quoted the above statement? Question #5: Do you know why you don’t know the answers to questions 2-4? Jesus didn’t say that. Paul didn’t quote it. It isn’t in God’s Word anywhere. And yet, that statement has governed my evangelism more than Jesus’s story about the sower, because, of course, Jesus’s story is crazy. Who would do what Jesus taught? Tossing the seed out as much as possible on anyone and everyone is crazy. They don’t know me. They don’t know how much I care. They may be wayside soil and need me to help plow their heart. They may be stony and weedy soil and need me to actually cultivate those relationships first. But that just isn’t want Jesus said. Of course you should care about people. If you don’t care, you won’t evangelize. Of course you should be nice to people. That is what Christians do. We love people. We don’t love people because that is the way we get to share the gospel with people. We love people because that is what Jesus did, so that is what we do. But understand this. When did Jesus most demonstrate His love for people? Was it when He fed them? Healed them? Cast out demons from them? Or was it when He went to the cross for them? Obvious answer on that one. When do we most demonstrate our love for people? When we feed them? Clothe them? Hug them? Give them a shoulder to cry on? Or is it when we teach them the gospel of Jesus on the cross for them? That one should be just as obvious, but we miss that one way too often. Don’t get me wrong, if you see someone in need of food and you have some, give it to them. If you see someone in need of clothes and you can give it to them, do so. If you see someone who needs a hug, give them one. If you see someone who needs a shoulder to cry on, offer them one. But what we really need to see is people who need the gospel. We need to share it with them. I’ve also seen folks who want to open with lines like, “You know you’re going to hell, don’t you?” An obviously dumb way to sow the seed. I get it, while we need to be crazy sowers, we don’t need to be jerks. We need to toss the seed everywhere and we need to quit acting like we are supposed to be testers or cultivators of the soil. But Jesus also told us to be wise as serpents while being innocent as doves (Matthew 10:16). Paul tells us we need to walk in wisdom toward outsiders, letting our speech be gracious (Colossians 4:5-6). Obviously, if you develop a relationship with someone, that is someone you need to share the gospel with. And you need to remember that you don’t love them if you won’t share it with them. So, let’s get evangelism right. Let’s let Jesus be our guide for evangelism and not Abraham Maslow. I get it. That means we’ll get told, “No,” an awful lot. Wayside souls simply won’t accept. Further, our retention rates may not be great. There will be plenty of stony, weedy souls that jump on the gospel and then abandon it. Who knows, maybe only 1 in 10 of the people we baptize will stick with it. I don’t know. But I wonder how many good soil souls we miss while we try to wait for just the right time to share the gospel with people, worrying about our retention rates. We aren’t evangelizing wrongly when we teach people who don’t follow. We aren’t evangelizing wrongly when we baptize people who end up not sticking with it. We aren’t evangelizing wrongly when we baptize people who don’t bear fruit. We are evangelizing wrongly when we keep the seed in our satchel because we aren’t sure how it will turn out if we toss the seed to that person. So, here is my problem. I’ve been working from the exactly backwards model for so long that I’m going to need to some help and encouragement sowing the seed everywhere. Will you help me? Let’s do this together. Are you ready to sow some seed like crazy? Thanks Edwin. Very helpful!!! I love learning new ways to be successful in winning souls. You’re welcome, Colette. And thank you for the encouragement. Absolutely dead-on correct. One of our elders and I were talking about this very parable, just yesterday, and agreed, our evangelism efforts are not in vain just because (1) seed falls by the wayside, (2) on rocky soil, or (3) among the weeds and brambles. We are all too worried about the results, not the effort. But, that’s God’s end of the stick to whittle. Thanks for chiming in, Royce. Stunningly true! My husband was a “crazy” sower, and reaped many. But he didn’t go to conferences and meetings and tell folks how to do it, and people where we worshiped didn’t always believe it when they taught them. They thought the results were just luck, I guess. Anna, that is great to hear. I would love to know how he connected with people and how he taught them. I garden a lot and this is something I have been saying this about the sower for some time. Am glad someone else gets it. And, you said it better and more completely than I have managed. So, I’m guessing here is what happened. I probably heard you say this years ago, but wasn’t ready for it to sink it. I guess you could say I was a bit of wayside soil for this message. But it finally worked its way in and came out in yesterday’s post. Thanks for being the shining light on this message. Keep saying it, someone else will probably get it some time in the future as well. Thanks, Don. (Insert “I’m serious” emoticon here). Thanks for the wonderfully simplistic teaching explained!! A message I could have received years ago, perhaps from Anna’s husband who sowed with reckless abandon, all over the world! Sow with smiles, kindness, compassion, patience, and optimism. It’s God’s Word in action we share, He will give the increase! Hallelujah! Hey, Edwin. Really good message. I’ve also missed this perspective when reading about the parable of sower. Thanks, Jack. Good to hear from you. I’m hoping this gets your attention…I wrote a comment on a blog you did on 8 Steps to Study a Psalm but haven’t heard back. The link you provided throughout the blog didn’t work and I’d really like to see your Psa 8 “map”. Could you send it directly to me? When I clicked on the link it took me to a blank page with the Evernote icon but no other words. Thanks for your help. Sorry. This is the struggle with the WWW. I haven’t kept up with this blog in some time. I keep intending to get back to it, clean it up, refresh and start over. Perhaps someday. As it is, not sure why the link isn’t working. Try the one below. Sometime in the future I may have time to go through and work on old links that are messing up.